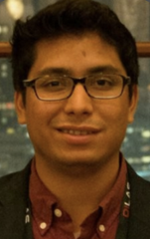 Fernando Zvietcovich Zegarra, a PhD student in the lab of Jannick Rolland, the Brian J. Thompson professor of Optical Engineering won best student paper award and best poster award at the International Tissue Elasticity Conference (ITEC 2018, Avignon, France). Fernando’s research is part of a collaboration on optical coherence elastography between Jannick and Kevin Parker of electrical and computer engineering. This is an example of how collaboration across departments and with international scientists can truly lead to excellent research. Fernando’s presentation also involved Panomsak Meemon from Suranaree University of Technology in Thailand, and the poster is a collaboration with Natalie Baddour at the University of Ottawa, Canada.